Why Everyone Loves WPBakery Page Builder? This is ultimate WordPress page builder plugin that can offer tons of features out of the box. Take your WordPress site to the next level within minutes and without writing a single line of code. Lots of content elements and predefined templates are just a small part of all capabilities offered by WPBakery Page Builder. 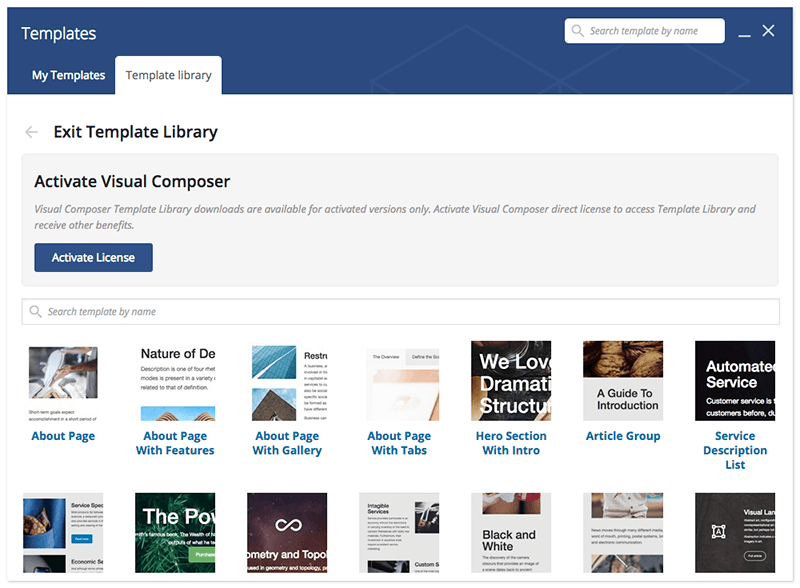 Access free premium class layout templates at WPBakery Page Builder Template Library. It takes seconds to build pro looking page, post or custom post type with multi-purpose downloadable templates. A unique feature available to direct license owners of WPBakery Page Builder. WPBakery Page Builder uses native shortcode way to build WordPress pages, posts and even custom post types. This ensures that it is compatible with other plugins and any WordPress theme. Why change your page builder from theme to theme when you can stick to one fully adaptable solution. There is unlimited number of reasons why you need WPBakery Page Builder page builder plugin for your WordPress site.